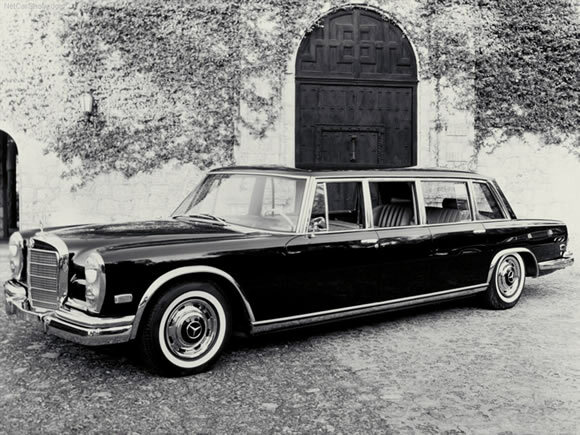 I really like old school Mercedes limo's, especially Pullman 600's. The perfect limo whether you are a movie star, mafia boss, communist leader, music legend or crime lord. The lines are perfect. New limo's don't really come close because of the current design of the cars limo's are generally made from. Too many curves and to me the roof of some new limos seems to dip in the middle. Strange. Designed to be the best you could get the Pullman had air suspension for a smooth ride and, to make sure it still hauled arse, a fuel injected 6.3 litre V8. Just the ticket to get away from screaming fans or screaming sirens. Definitely a beautiful way to travel.